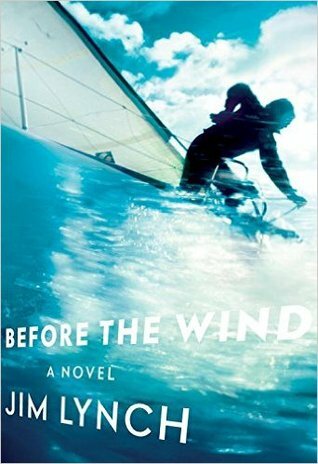 At the most basic level Jim Lynch’s new novel Before the Wind is the story of the Johannssens—a sailing family in Seattle, Washington. Or as Josh Johannssen’s younger sister Ruby liked to claim “And there’s a reason we’re so good with boats: we have a higher salt content in our blood!” A fact which his long suffering older brother Bernard would point out was based on “one misleading blood test that showed Grumps had high sodium levels.” His father and grandfather build and race boats and his mathematics loving mother uses the equations of physics and fluid dynamics to make them work best. In 2012 after a decade apart the family comes together again to compete in the Swiftsure International Yacht Race and there is nothing basic about their reunion. A classic middle child, Josh is the fulcrum on which his family teeters. He’s as quiet and steady as Bernard and Ruby are mercurial and unpredictable. For Bernard, the increasingly obvious reality of what’s wrong with the world leads him to take part in the WTO riots in Seattle after which he steals a boat and disappears. Years pass with random letters from other countries—he is taking on Japanese whaling vessels, selling pirated butterfly collections and sinking a greedy millionaire’s yacht. While Bernard fights for his truth, Ruby gives for hers. Imbued with a funky spirituality she finds the wind in a flat sea that makes a boat speed across the water and erases people’s pain with the touch of her fingers. She is a gifted sailor, fluid and graceful on water, but clumsy as a toddler on land. In 1999 she throws the race that would have made her part of the 2000 Olympic sailing team and goes to South Africa as a volunteer on a medical ship. A novel about a sailing family must include nautical terminology and references and Before the Wind does but not in a way that’s forced. Instead, Lynch surfs from the playful, when he compares an older boat’s assessment to a doctor’s exam of a middle-aged patient. You tap her decking to check for rot (bone loss) and listen for structural weaknesses (bum hip or shoulder). You hunt for deep blisters in the hull (skin cancer) and see how worn out her sails (lungs) are and make sure her engine (heart) sounds reliable and that she hasn’t been sailed so hard (lived so recklessly) that her rigging or mast step (adrenals) are fried. to the high-intensity of competitive sailing in bad weather. His profound love of sailing saturates each page but goes beyond the technical to the deep-water realms of the beguiling Johannssen family. His prose effortlessly summons a bombastic father, a mother trying to carve out her own space in her life and a fearless water sprite of a sister. And then there is Josh, the son who doesn’t leave, who lives on a boat and who’s romantic life has been reduced to a stunning lack of success in the online dating world. During a moment of downtime in the Swiftsure race, when his father and brother question his lack of ambition in life, it is Ruby who speaks up. He’s the one who’s always seen the best in each us…And he’s also the only one who thinks he can fix whatever’s broken even though he knows it’ll just break again. He’s our confider and accomplice, and probably does the same stuff for a whole lot of other people. He tries, against crazy odds, to keep everything and everybody intact. That’s his ambition. Charming and exuberant, Before the Wind struck me much the way The Boys in the Boat did—even without any knowledge of or interest in rowing I could not stop reading. I have been sailing maybe twice in my life, but the novel captured my imagination completely. Fictional characters, yes. Over-the-top, maybe. But would I like to meet them? Hell, yes. And…might I like to be one of them? I think so. Because at the heart of all the eccentricity, the wild stories, the bluster, the Johannssens come across as vibrantly real. Every breaking wave, sunshine bright, capsized, bottomless bit of them touched me. Ooh, I really like Jim Lynch and didn’t know this was out, so I’m very happy you read and reviewed it. This one sounds right up my alley. I’ve never read Lynch before but am now ready to go- any advice on which book to go to next? I met him last night and it was so amazing. 200 people turned out. I don’t believe he’s written all that many titles. I’ve read The Highest Tide and I THINK I read Border Songs. Both so long ago I’m not sure which I would recommend, but I’d say Tide. That’s a fantastic turnout! I’d love to hear him speak. WOW! This sounds really interesting, Catherine, and so great that you have a connection to the setting, as well; I don’t know anything about sailing, or have any experience with it, but I’m still intrigued by this family…and I loved The Boys in the Boat, too! Thanks for sharing this one! I’m not a sailor myself, but am a powerboater driving one of those stinkpots and have some sailors in my family. You mentioned some of this was over the top…and based on my exposure to sailing and racing culture, it seemed pretty accurate. Maybe not quite to the extent the Johos went to, but he captured the general idea well. Again – thank you, thank you for pushing this book into my hands! Whew…I was nervous you wouldn’t love it as much as I did! It is great to hear from someone who knows that world- especially that it was accurate. I don’t remember the parts I thought might be a bit much- maybe it was the more mystical aspects of Ruby.